I had a really lovely day today. It wasn’t too hot, there was a gentle breeze through the yard and there was lots of gardening to do. Who am I kidding – there’s always lots of gardening to do! Admittedly, I didn’t do a scrap of uni work today but I had such a busy week, I felt I deserved a day off. It’s wonderful to watch everything grow and change this time of year. In the space of a few short weeks, we’ve gone from buds to flowers to fruit forming on the cherry, apricot, plum and nectarine trees. The strawberries have been delicious and reasonably plentiful despite having only a handful of plants. 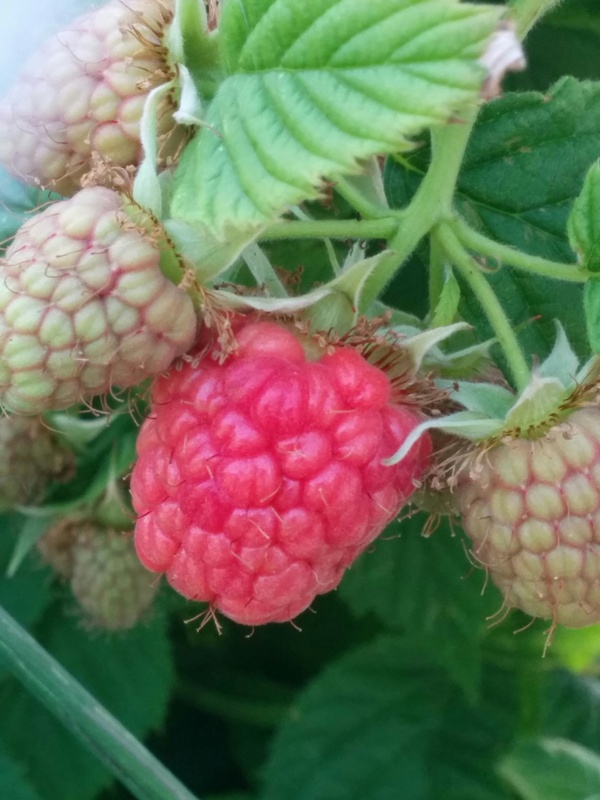 But this morning we picked and ate the first raspberries of the season. It was quite a momentous occasion, I think it always is for people who grow their own fruit. When I was a child in South Australia (a far more Mediterranean climate than here in Tasmania), we would pick the first stone fruit – usually early apricots – and my mother would cut it into equal pieces for us all to share and she insisted we make a wish on the first of the harvest. It’s a ritual I’ve continued to this day with my family and whoever happens to be with us when it happens. This afternoon I started cleaning out the other side of the greenhouse in preparation of the main Basil and Chilli crops. Because the climate here in Hobart is on the cool side, I always grow these in plastic pots in the warmest spot I can find. So far I have all the common Sweet Basil (Ocimiun basilicum) potted up, about 40 plants this year. But there’s Thai, Mammoth and Lettuce Leaf (my favourite for pesto) plus more varieties of chillies ready to go now and nowhere to put them at the moment! What are your favourite family rituals? Leave a comment below.